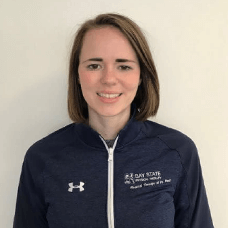 Carolyn earned her Doctor of Physical Therapy degree in 2018 from St. Ambrose University after getting her B.S. in Kinesiology from Iowa State University in 2015. Her passion for physical therapy began after a physical therapy service trip to Costa Rica in college. Carolyn’s clinical background includes acute care, inpatient neuro rehabilitation, and outpatient orthopedics, with a special interest in women’s health. In her free time, Carolyn enjoys reading, running, hiking, and spending time with her cat, Tonks. She also enjoys traveling, especially to national parks, and one of her goals is to section hike the length of the Appalachian Trail.